Funeral begins for Hallel-Yaffa Ariel, who was murdered in a shocking terror attack in Kiryat Arba, amid outpouring of grief. 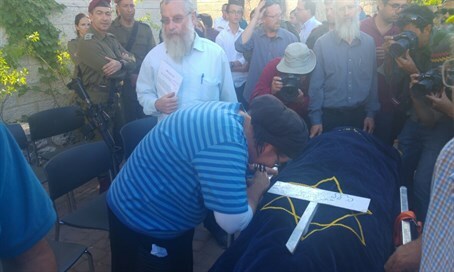 Thousands of mourners have gathered in the Judean town of Kiryat Arba near Hevron on Thursday afternoon, for the funeral of Hallel-Yaffa Ariel, the 13-year-old girl murdered in her sleep by an Arab terrorist. The funeral procession began with eulogies outside the Ariel family home in the Ramat Mamre "Charsina" neighborhood at the edge of Kiryat Arba, and is making its way gradually to Hevron's Jewish cemetery, where the tragically young terror victim will be laid to rest. Prominent officials, including Israeli Education Minister and Jewish Home party leader Naftali Bennett, are among the mourners. Chief Rabbi of Hevron Dov Lior was among the first to pay tribute to Hallel. "She fell for the sake of the independence of the nation of Israel," he said, comparing her to other Jews martyred by oppressive regimes. Rabbi Lior went on to attack the government for its policies which, he accused, "broadcast weakness." "Our leadership indirectly contributes towards their evil," he said. Agriculture Minister Uri Ariel, who is a first cousin of the victim's father Amichai, eulogized young Hallel with a call to strengthen the Jewish presence in the land of Israel. "We say to the mourners: through the building of the land we will be comforted." "This cannot be just a demand - this is a Torah command!" he added, "I stand here and say to you Hallel, and to all the Ariel family... we vow today to further build up the land of Israel." Turning to the prime minister, he continued: "We are calling on to: apply the complete sovereignty of the State of Israel on all parts of our land." Education Minister Naftali Bennett struck a similarly defiant tone with a moving eulogy. "Whoever gives up on Kiryat Arba gives up on the entire country," he said. "This war goes on. This battle continues. The world stands at a crossroads, attack follows attack - a river of terror, and the worlds blames Israel," Bennett continued. "The nation of Israel connects with you," he told the bereaved family. "The nation of Israel sees you and our hearts break." "Rest in peace, oh flower; rest in peace, young child; rest in peace Hallel." "This morning our daughter, 13-and-a-half years old - an incredible girl - was murdered in her sleep," she continued. "Every father and mother should consider their own children and they will feel slightly the pain that we are feeling now." Rina called on the public to come to Kiryat Arba to provide moral, and physical support to the family. "We invite everyone to come and help, to console; there are vineyards which need help, there are Jews here who need strengthening. We are strong and we won't break, but we need your help to continue and to build here." "Hallel loved living here... right now we are just crying out 'By your blood you shall live! By your blood you shall live!'" she continued, quoting the biblical passage. Hallel's father, Amichai, said he and his daughter were scheduled to work together at his winery that morning. "Last night she came back from a dance performance," Amichai Ariel recounted. "She was an amazing girl." "She worked very hard for years to become a dancer. She put so much effort into everything she did. God gave her a great mind, lots of wisdom. She was so bright." "This morning at 9:30 we were supposed to work together filling bottles with wine." "Hallel loved living here, loved the place," he continued. "She wasn't afraid of anyone. She never imagined - nor did anyone else - that an evil person, one of 1.5 billion Muslims who just want to drown the world in rivers of blood. That's what they live for. Its terrible, just think about it: A little girl who did nothing." Rina, the mother, spoke at the funeral. "God, Father, how do you give a eulogy for a 13 and a half year old girl? I had the merit of giving birth to you and from that moment on my life was filled with light. For 13 and a half years you gave her to me for safe keeping, and now I give her back to you. But Father, there's no more room up there in heaven, the people of Kiryat Arba have already filled it. "Sarah, our mother, hold her close up there, even though it's crowded. Hallel has gained a mother and father in heaven." Hallel's mother continued: "I want to address the mother of the terrorist who did this. I teach my children to love and you've educated yours to hate. God, take her, she's yours now, I've finished my part." Rina ended the eulogy with the Shema prayer.